Create customized reports for all kinds of purposes and in your branding with just a click. QPLIX offers you a wide variety of report elements to configure your individual report templates. These reports can then be generated on the current data basis with just a click and for different recipients, languages and currencies. QPLIX enables you to manage all different kinds of asset classes (liquid and illiquid) in one tool. The software provides a holistic view of the asset allocation and performance and enables you to compare different asset classes with a variety of metrics. The analytics tool is designed to slice and dice your portfolio in all available dimensions. The platform makes incoming data instantly available to support your decision-making process and therefore enables you to discover real-time performance insights and to make faster and more efficient decisions. Your team plays globally? We love it. QPLIX enables the tracking of every asset in local currency and its original time zone. The software offers a consolidation of the portfolio in the currency of your choice and shows the split between asset related valuation changes and fx effects on a daily basis. The software offers a solution for electronic document management. Transparency is established by deep linking of transactions and entries to corresponding parts of a document. Furthermore, the platform provides structure and assignment to a compatible hard copy filing system. QPLIX automates most of your daily accounting tasks and improves your accounting quality by leveraging a rule-based accounting system. 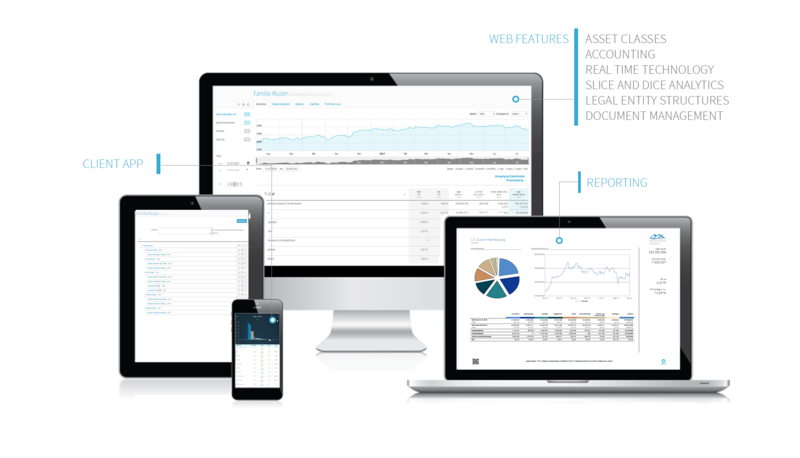 Also, it connects perfectly with external accounting software and includes a solution to keep your asset management in sync with any external system. QPLIX makes it simple to act within complex (and changing) legal entity structures. The software enables you to manage an unlimited number of legal entities in complex and changing groups and to view various perspectives within this structure. Real time consolidation is provided on every level. QPLIX provides an “Investor Portal” App, which allows investors to have a look at certain predefined views incl. metrics of their allocation and click through the available levels and dimensions. More than 200 different reporting metrics can be provided for the app. Download via the regular App store. On the QPLIX platform, you can define your own alarms and thresholds on the basis of more than 200 available metrics and any property. Furthermore, the system enables you to establish a linked notification system, such that selected users are notified once thresholds are surpassed.